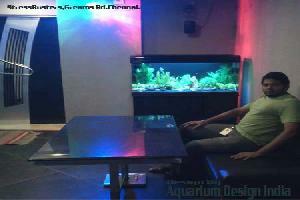 For the best in personalized aquarium maintenance, contact Aquarium Design India. Our expert technicians specialize in all types and sizes of aquatic displays. Our years of experience mean an efficient and worry Free Experience For you. Suggestions for proper supply of fish and creatures from around the world, invertebrates, live plants. The beginning of a cooperation with Aquarium Design India will allow you to enjoy the beauty and serenity that water features offer, saving you the trouble of dealing with maintenance issues, keeping a proper image, at a low cost. Aquarium Design India staff is trained to provide high quality services to aquariums, ponds and almost any water feature. The maintenance schedule usually involves 2 or more visits per week and can be customized to your needs upon request. Our technicians not only do they focus on the appearance but also into the health and well being of the living organisms. Aquarium Design India guides clients on the selection of fish and living organisms. Specific accumulated knowledge regarding the design and viability of the species, allow us to achieve the best possible result. Our qualified staff ensures via regular visits the smooth operation of the electrical equipment, very important element for the longevity of the system. To schedule service and maintenance appointments, please contact Ashick, our director of service at 8754586573 .